My Line Is Red: Downtown Silver Spring: What's Up, June? June is gettin' hot. 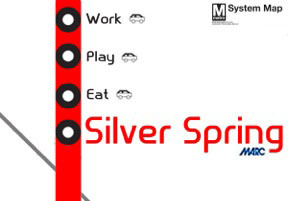 Tons of events and so much to do in Downtown Silver Spring to close out spring and kick off summer. Here's a list of what's going down in the neighborhood. If you have an event, party, happy hour, sale, etc to add in DTSS, send it my way! I&I Riddim (reggae band) will be performing live outside on the patio of Piratz Tavern. Also grand opening of the Tiki Bar. Drink specials all night long. Kiki DC at The Fillmore. Presented by Pyramid Atlantic Arts. As per the event site, "more than 25 area artists and fashion designers have been selected to create original wearable art to be modeled on a runway before a panel of celebrity judges. Funds raised will support arts education programs for artists of all ages and abilities. Wearable Art is this years fashion show theme. Think paper dresses, colorful jackets made from crushed glass and bikinis made out of painted bottle caps. More than 25 area artists and fashion designers have been selected to create original wearable art to be modeled on a runway before a panel of celebrity judges." Blues Week Kick Off Party. Great Hall of the Silver Spring Civic Building. Grand Opening of Starbucks Sheraton on Georgia. Free samples in the hotel lobby. 5th Annual Blues Festival. On the Market Stage (Veterans Plaza) 10am to 3 pm and On the Fountain Stage (Ellsworth Drive) 3pm to 9 pm. Free! Bands and info here. AFI Docs. Individual tickets are $13; combo tickets are $100. Check out the program guide for scheduling. Look for the showings in the purple boxes for those at AFI. There are some really great features this year. I'm looking forward to 'Approved for Adoption', '12 O'Clock Boys', 'White Black Boy', and 'Rent a Family, Inc.'. There are so many great documentaries this year. Make time to support the neighborhood restaurants and catch dinner and a doc! Early to mid June. New restaurant opening - Pete's New Haven Style Pizza on Wayne Avenue. Delivery from day one! June 22, 10am for kids and 11:30am for adults. Free yoga by Sky House Yoga. At the Fenton Street Market on the plaza. Bring your own mat. June 27. Lagunitas Draft Night. Scion Restaurant on East West Highway. As per City Paper, they will be "featuring several beers usually only served at the brewery's tap room." Early Summer. Sweetgreen coming soon. I'll tweet an update as soon as I hear. On Georgia (old Living Ruff space). What did I miss? Shoot me an email! Gebeta has live Ethiopian Jazz twice a week - and wonderful chilled Ethiopian honey wine. Vicino's has live jazz on Monday nights. Every so often Cissel Saxon will have a band play upstairs - Jazz/blues/vintage rock. It's about as sticky floor real as you can get anymore in upscaling Silver Spring. Andrea's Fine Hats, on Eastern Ave, is the place to find great summer hats for men and women. Another Silver Spring institution - Men in particularly can find something that will be just the thing this summer.